The Original Series MKII (OS2). All new safety requirements are met and surpassed with the lastest British Safety Standard BS 7928 : 2013, as one would expect from Masuri. A favourite for many years with International players all over the world including Brian Lara, Jaques Kallis, Robin Smith, Brendon McCullum, Matthew Hayden and many more. Masuri have combined modern manufacturing techniques and the latest technology in plastics with Masuri's traditional DNA to bring back the Original Series range . British designed and manufactured single shell protection, providing an affordable and lightweight helmet for the cricketer that prefers the old style traditional Masuri helmet to our new High Tech Vision Series range. OS2 utilises the soft cell foam front and back liners to contour to your head shape ensuring a snug fit every time without the need for a cumbersome adjustor. 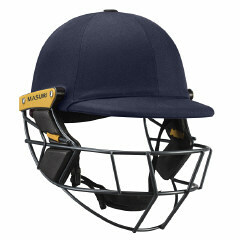 The Test Titanium model is cloth covered in 4 colours and comes with the Masuri tried and tested Titaniium visor. Please select size and colour options from the drop down list.